Your flower blooms are luscious!!!!!!! Fantastic! So beautiful! Love the vivid colors! Happy Birthday Altenew! My favorite set and you did it right! So pretty!! What fabulous cards! Those droplets make the flowers look so fresh! Beautiful color and dimensions! Those flower really look wet with dew! Gorgeous card! Congrats to Altenew on your 5th Anniversary!!! Great card – love those bright, bold colors! Perfect colors for a tropical card, love the layered flowers…gorgeous card. Beautiful colors, looks tropical, dew drops perfect. So, so, lovely! Amazing florals. Those colors just pop! I’ve never used a 3D layered die, I can see why you like them so much. Thanks for the ideas! WOW such a stunning card, the colours really pop, I love it!! Fabulous card! Love the colorful blooms! Thanks for the inspiration! Happy anniversary to Altenew! beautiful work. I cannot wait to get my new order from altenew. Your design and techniques are amazing. Your blog is a really good place for inspiration. Floral does I tell myself I don’t need them, but I think I’m wrong! Lovely card! I really enjoyed the video! I’m going to look for the shimmer pens! They add a nice touch! Happy 5th Birthday to Altenew!!! I love the colors you chose for these 3 day layered flowers! I absolutely love those layered dies! Gotta try them. Cute Ideas! Love the colors. Happy Anniversary to Altenew! Great colors for your peony stacks. Fabulous card. What a gorgeous card. Makes me feel like I’m walking through the garden on an early morning while the dew is still on the flowers. Absolutely amazing! Such an elegant, tropical card Gayatri! How exciting to get to meet Tasnim and Therese tomorrow, so very cool, enjoy! And happy 5th Altenew! Beautiful bold colours. Love it! Oh my, I just figured out by reading your blog how everyone was getting these pretty 3-D flowers. I am new to Altenew and didn’t realize that they sold these 3-D dies. You have made me a fan of them for sure!!!!! I love the look of your card, it is stunning! I am now going to have to invest in these dies and try them out for myself! Oh how I keep spending my money with Altenew! So fun though!!!!! Those peonies are so beautiful! Perfect spring colors! HB To Altenew! You rock! Oh my! Absolutely stunning , love the color palatte! TFS. The workshop sounds like fun!! Gorgeous card! I don’t have any of the 3D dies yet but I am definitely adding them to my wish list. Wow.. Absolutely beautiful your card is Gayatri ! Love the 3D flowers and colouring. Pretty card! Congrats to Altenew on your 5th Anniversary!! Wonderful flowers, layering and coloring. love your style. I love the 3 D dies too! Love your use of color with this card. I love the layered floral dies as well and this is a beautiful card. 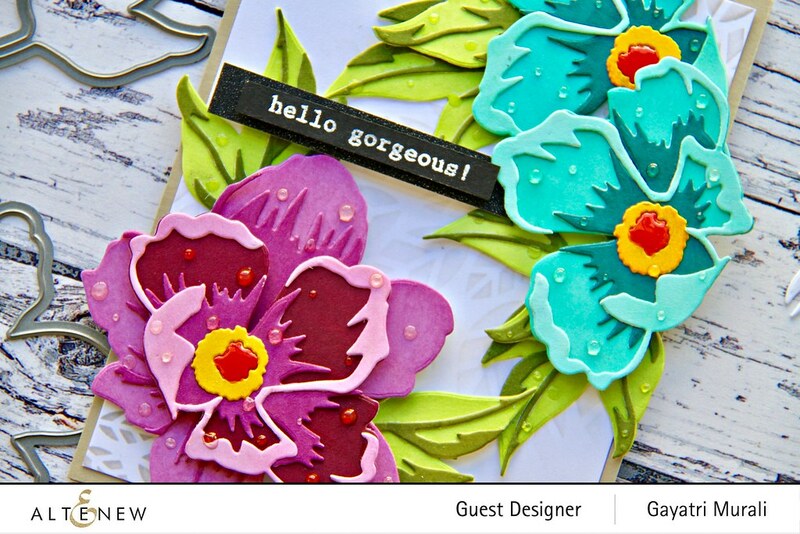 Love the use of the Altenew floral dies. The colors you chose really pop! Gorgeous card. I love the vivid colors. I, too, love Altenew’s 3D dies and the Peony Dream set is definitely on my wish list. Simply stunning! Love the floral stamps and dies! Lovely card! I love the colors. I thought I wouldn’t get that 3d flower die set but I keep thinking how I would use those 3d flower dies. love your cards. So bright plus I like the embellishments Made it look like dew drops on the petals of the flowers. Congrats Altnew on 5 awesome years..
Lovely card. Nice color combo. Thanks for the video. Beautiful card and I love the colors you used as well as the droplets. So pretty. Great job! Those colors are just right! What a beautiful card. Thanks for sharing. Wow! This card is gorgeous! Lovely card w/so many layers and dimensions to pop right off the page! Whoa…love your card, the colors are amazing! Fantastic blog hop and some amazing projects! Happy 5th Altenew. I love the colors of your card. The flowers look so vibrant and dynamic. Awesome job. Thanks for sharing your creativity! Beautiful card. I love the colors and the way you arranged the flowers on the card. Happy 5th anniversary Altenew! Fantastic cards! I love the colours you used for the die cut flowers! Hello Gorgeous, it is! Love the layering and vibrant colors! Stunning card, love the bright colors. The 3D dies are so cool. Awesome card. Bright and Bold. Thanks for sharing. loving the layered look of this card and it’s tropical vibe!!! beautiful job, thanks for sharing!!! Vibrant colors and Beautiful layering! Love your embellishments as well. Thank you for sharing your art! So beautiful, this would bring a smile to anyone’s day. Beautiful! I love the 3D dies! The paper pieced flowers are beautiful! You did a great job. Thank you so much for sharing. Alenew has a great design team!!! What great colours you have used. Love this project. Love Altenew. Love that we able to celebrate 5 years! What a gorgeous card! I would have never guessed you could achieve such saturated color with markers. Your card is one of my favorites so far. Keep up the good work. I love 3D flower dies! Your cards are so beautiful, love the colors and layout. I had thought that these dies were used with different color card stock. It didn’t occur to me that I could use my pens. Thank you for this tip. I feel so empowered. Thank you! Beautiful card! Love the 3D dies and great color combinations. Great to watch your informative video on putting together your beautiful card and inspires me to do something similar in the future. Thank you. Man, those 3D layering dies get me every time! I also love the idea of using the artist markers to color the cardstock with coordinating shades. What a gorgeous card! Love the 3D dies also, Gayatri! Your card design is beautiful. WOW! This is amazing!! I LOVE the dies and colors you chose! Beautiful! Love these vibrant color peonies! I adore the bright colors! The way you did the clear dew drops is soooo cool! Stunning card!! Love all the layers and vivid colors! Love the colour combinations you used to create these flowers & they are arranged so well. Thanks.I also like the clear drops as accent. I just love the 3-D flower dies. You are designed a beautiful card and I love the colors. So pretty, and the leaf stencil gives just the right touch to the background. Thank you for he video! Love the color combo of the dies. The dew drops are the perfect embellishment, love everything about this card! Beautiful card! Fantastic colors, I love the layering dies. Thanks for sharing and congrats to Altenew! Beautiful tropical cards! Love the colors. Gorgeous card Gayatri. 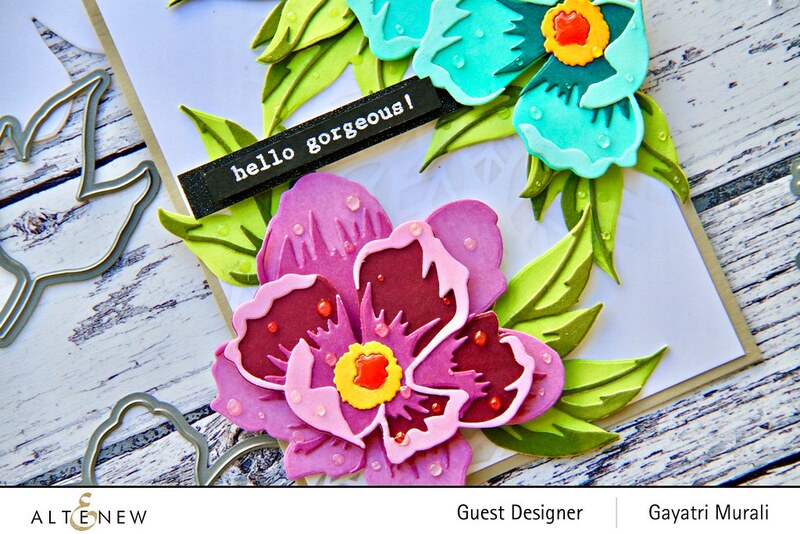 Love those die-cut flowers… those vibrant colors are lovely! Great layers. The stenciled background looks pretty. Happy Anniversary to Altanew! The 3D flower die sets are my favorite although I only own one. Love, love your card. Those flowers literally look like they are lit up from underneath. The card stock colors are so gorgeous. Thank you for sharing your art! The colours you used are beautiful. Lovely card. Such bright and cheery colors! The Peony Dream 3D die set is one of my favorites! Gorgeous color combos on your beautiful card! I’m enjoying all the inspiration on the hop to celebrate along with Altenew on their 5th anniversary! Definitely hello, gorgeous! Love your vibrant color and design…I have to immediately go cut some bright colored Peony Dream flowers & make one of my own! Great cards. Tropical vibe. Love the summer feel to these. Happy Birthday Altenew and many more! Gorgeous cards! I love the Altenew 3D die sets too. But then, I love everything Altenew! Oh wow, the flowers are so vibrant and colorful. Very pretty and perfect for springtime. Gorgeous card. I love all the colors you chose for the blooms. Happy 5th Anniversary! I really like how you colored the flowers with such ease and put them together to make such a spectacular sight. They are lovely and so complimentary! Fantastic and I like how you said thrice in your video! Happy fifth birthday Altenew!!!! Love those flowers and your card is gorgeous! I so agree with you, the 3d flower dies from Altenew are amazing. I have to get one of the sets. Your card is so beautiful. Lovely card. I love the 3D layered florals and the colors you’ve used. Very pretty. Thanks for your inspiration Gayatri! Love Altenew products! Beautiful card, thank you for inspiring us. All I say is “WOW”! Perfect spring/summer card! LOVE the bright colors, the flowers, the droplets…they look like real water droplets. Very talented! 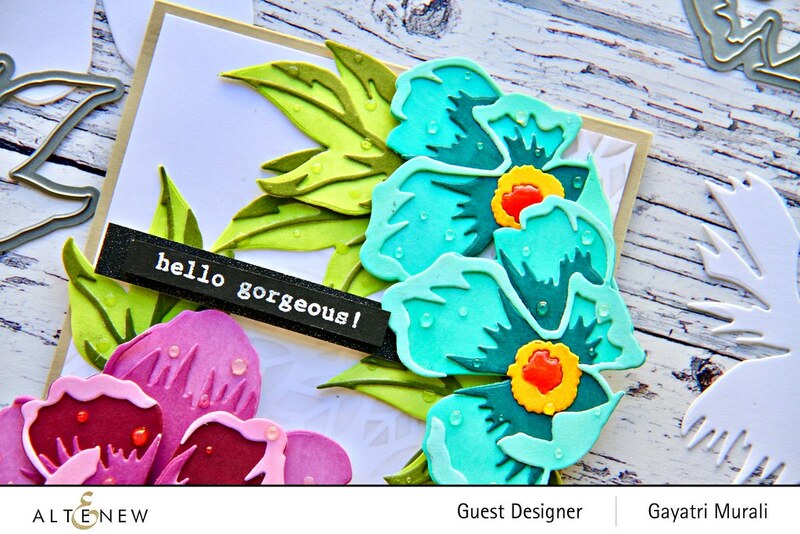 Colourful, beautiful card — thank you for the great videotutorial ! Love the colors you used on your flowers. So vibrant. Your card is very beautiful. Thanks for sharing. Wow, I love the bright tropical flowers. The stencil on the background is a really neat idea. Thank you for the video, I love your creative process. Love the bold, vibrant colors. Wonderfully vibrant card! Love the color combos and card design. Thanks for sharing your creation and thanks to Altenew for providing so many wonderful products and inspiration over the past 5 years. Happy 5th Altenew! What a awesome card, such great colours and composition. Thank you Gayatri for your inspiration, video tutorial and participating in this great Altenew 5th Anniversary party. Your coloring is always spectacular! I love your card! So VIBRANT , I love it 🥰! 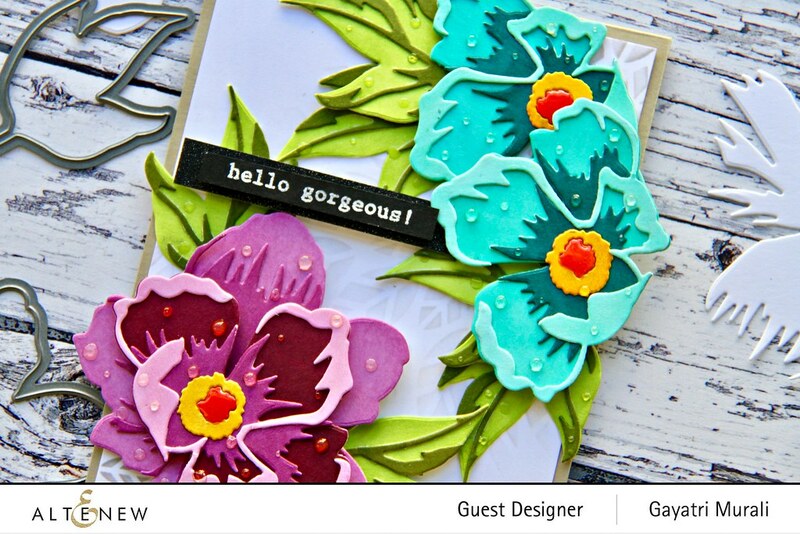 I love my Altenew 3D floral dies – the colors you’ve used in this card design are just gorgeous. Pretty fun to see how different the flowers look when you use such different colors for them! The “dew drops” on the petals are the perfect touch! Beautiful! Happy Birthday, Altenew! Bright colors! I can’t wait to own some of the 3D dies. So many ideas! What gorgeous florals! I love the colors! Congratulations to Altenew for five years of amazing products and inspiration! Amazing colors! These 3-D flower dies are terrific! Great flower cards! Love the droplets. I love the droplets on your card! And the colours! ❤️ Hope you had a good trip to the land down under! Love the card, and the colours are so vibrant! Fabulous card! Love this die cut and your wonderful style. LOVE your 3D peonies, such pretty colours, detail & dimension and you have added the PERFECT finishing touches! Breathtaking card with so many fantastic details! I love the stencilled background and the glossy accents too. It was fun meeting you yesterday! So much to love at Altenew. Love your 3D project. These dies add a new dimension to card making–literally and figuratively! TFS! Gorgeous card- love those bold bright colors! I love Altenew’s flower dies too! Impressive!! Love the vibrant colors and dimensions! Fabulous card – your colours for your flowers are so stunning – they are bright and bring joy to my eyes! Love your card. Thanks for the video. It was wonderful to watch you assemble your peonies. Thanks for the inspiration! Beautiful card. I thought they were stamped until I watched the video. I love how bright the colors are. Gorgeous card Gayatri! So vibrant ❤. Your card is gorgeous, Gayatri! 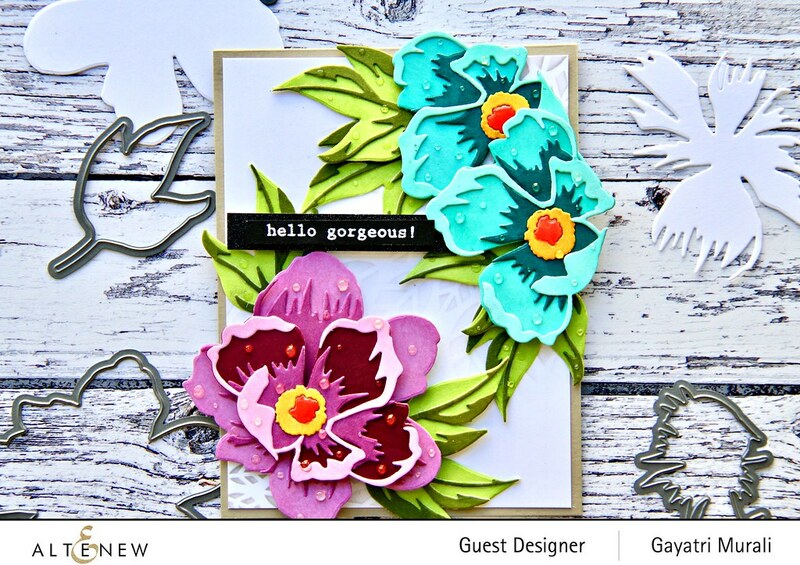 I love how you made those bright, bold 3D peonies…the colors you used were so beautiful! Thanks for making a video showing us how you made your card…very helpful! Wow, such vibrant colors! The layered peonies are beautiful and give so much dimension to your card! Thanks for the tutorial. Totally amazing Gayatri. These peonies are stunning and look incredible. Wish I could have made it to Melbourne. Fabulous card! Love your colors and wonderful style.Thanks for sharing!! the 3D dies are genius and your use of them is so inspiring. Your card is so pretty. I never thought you could make such a beautiful card with just die cuts. Great job. How did I miss those 3D Peonies? They are just gorgeous. Love the dimension, and the colors you chose show them off well. Such a great card. Thanks for helping to celebrate Altenew’s 5th Anniversary by sharing your wonderful work with us here! I love how you can layer these flowers with any iteration of dark-medium-light and get fabulous looks no matter what. Your card is gorgeous and makes me want summer even though I don’t actually like summer all that much! Beautiful card, Gayatri. Love the bold colours. Congrats to Altenew on completing 5 years. Wishing them many more years of success. You are so very right, the purples and teals do look so good together……so rich and divine! Beaitiful, and the way you used the Glossy Accents gives such a neat effect! Beautiful!! Those 3D layering dies are really fabulous!! Vibrant and tropical looking. Thank you for sharing your talent. Love the bright bold flowers on this card!! Gorgeous!! I love these dies. They are so beautiful!! Your card is gorgeous!! I love tropical flowers, I’ve always been a sucker for anything tropical. Beautiful! This set is on my wish list! I absolutely love the blues and purples! Very bright and springy! Beautiful!! I love the glossy accents look on the card, like fresh spring flowers in the morning! How beautiful, love these 3D dies. Thanks for sharing and Happy Anniversary Altenew! GAH….. those Peony 3D dies get me every time! LOVE, love your beautiful, amazing colors! !